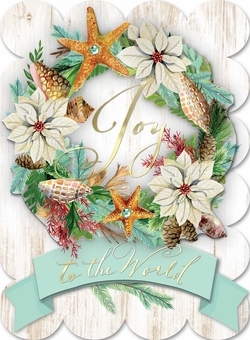 Express yourself this holiday season with these gorgeous nautical Christmas cards! They feature a sea-themed design. A wreath shows off poinsettia flowers, pine cones, starfish, seaweed, and seashells! For a beach-lover, it's a great way to bring some of that coastal flair to winter. "Joy to the World" has been written upon the card, and gold foil and gems add some sparkle and shine.